Rhubarb is a popular vegetable in the Eastern Part of France where I grew up. It’s mainly used in desserts, and rhubarb tarts or jams are very famous. That’s the way I grew up with, but some people cook it as fish or meat accompaniment. Rhubarb has a great benefit, it’s that it has very low calories and is great for transit due to high fibers, but being tart people tend to use a lot of sugar, so of you’re no to careful about the sugar you’re adding, it ends up being a heavy dessert. I like tart sensations, so it’s fine for me, but for those who like it sweet and are watching their calorie intake, it’s better to use half sugar half Splenda. American rhubarb is more red than the French one and bigger. 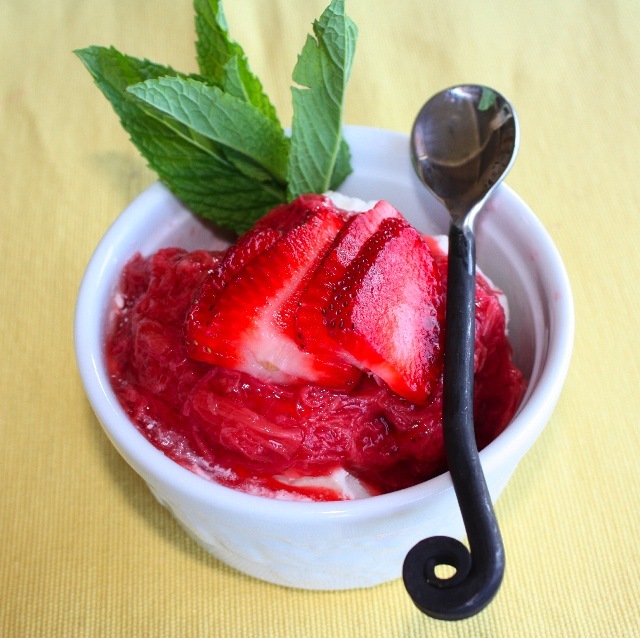 Strawberries go wonderfully together and this compote is also delicious with yogurt. Compote is a French word to describe the mixture you get cooking fruits at low heat. It contains low sugar, sometimes no additional sugar at all so it’s a lot less sweet than a jam. This compote goes even better with homemade vanilla ice cream, and with summer being around the corner, what is more perfect than this? fresh, fruity and so light. Wash the rhubarb stems and peel them, like you would peal a rapini or asparagus, you will see that the inside part of the stem is green. Cut in 1 1/2 inch pieces and put in a cooking pot. 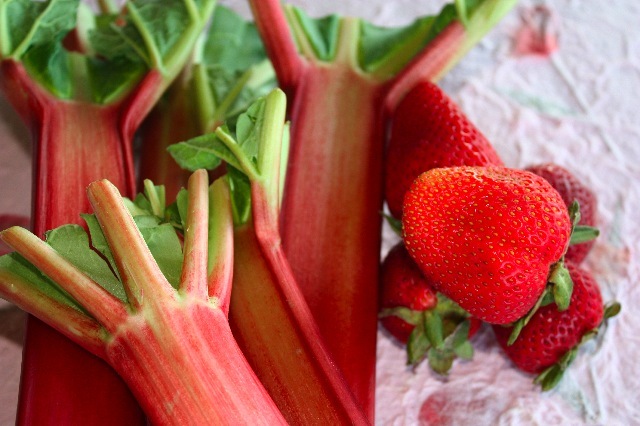 Wash strawberries and cut in pieces, add to the rhubarb. Add sugar and/or Splenda, to your liking. Cut one vanilla pod, grate the inside, add pod and cook mixture at slow temperature until the fruits are cooked and become like a jam consistency. Mix milk, cream, sugar and vanilla extract in a container. Mix well until the sugar has dissolved. Add to the ice cream maker and let the ice cream thicken for about 25 minutes. Place in the freezer for about 15 minutes or eat as is, as a creamy and soft ice cream. Spoon fruit compote on top of ice cream. This entry was posted by silvia on April 21, 2009 at 6:41 pm, and is filed under Desserts, Express - Less than 30 minutes. Follow any responses to this post through RSS 2.0.You can leave a response or trackback from your own site.